The vermiestabilization or vermicomposting process is referred to the organic matter digestion and management by the earthworms. In the antique Egypt the earthworms were already considered as sacred animals and who damaged an earthworm was severely castigated, because it was well known their importance over the soil fertility. Similarly, Greeks and Romans were conscious about the relation between the earthworms and the fertile soils. But Charles Darwin was who explain the function of those organisms publishing in 1881 the book The vegetal land formation through the action of worms. Since then the worm culture was developed as a method to obtain substrates with high fertilizer power. This process has been developed since years as rudimental form in Philippines, China and other Asiatic southeast countries, as well as Central and South America countries. Since years those techniques are realized in Europe (Great Britain, Holland and Italy), with the innovation of the use of the final product as fertilizer and substrate in horticulture. The first approximation of the possibility to use the worms for organic matter transformation was made by Watanabe and Tsukamoto in 1976, and the first time that the urban depurator lodes were used was in 1977 in the University of New York. 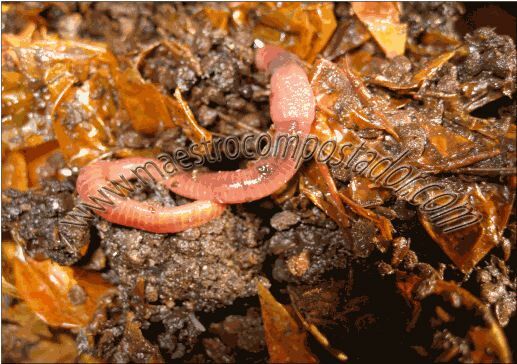 Vermicomposting could be defined as an organic matter bioxidation and stabilization method, mediated by the combined action of earthworms and microorganisms, obtaining a thin grain, homogeneous and stabilized final product denominated vermicompost. As in all biological treatments related with biowastes management, they are process that happen in a natural way in Nature and that close the organic matter cycle. For this reason, if we want understand and apply those processes we need to know the implicated organisms, their characteristics and necessities.